Put simply, découpage involves cutting out pictures, gluing them to an object and then coating the pictures and the object with layers of varnish. The finished item can look so beautiful that it appears to be professionally painted. The word découpage comes from the French verb découper, ‘to cut out’. 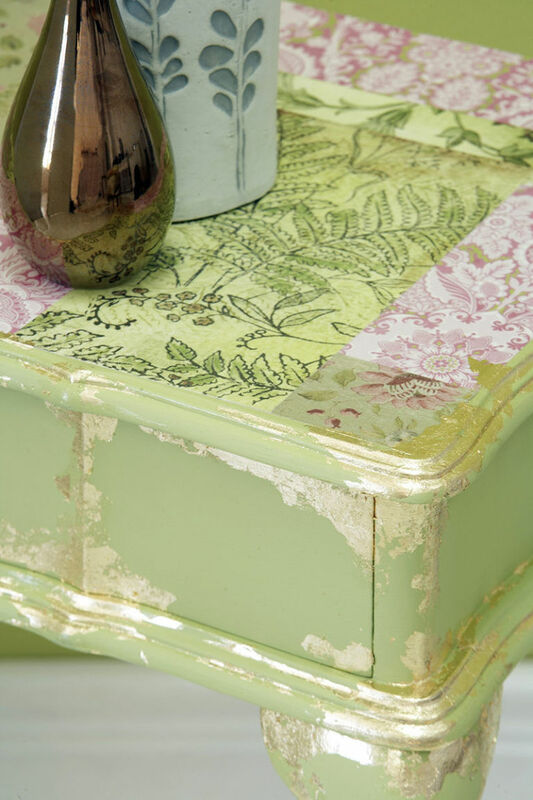 The découpage technique can be used to personalise almost any item in your home and the great thing is that the designs can be as simple or as complex as you like. You can buy a large selection of supplies specifically for découpage, but the nice thing about this craft is that you probably have many of the supplies lying around at home to be able to start simple projects right now! All you will need to start with are a few basic materials and tools. 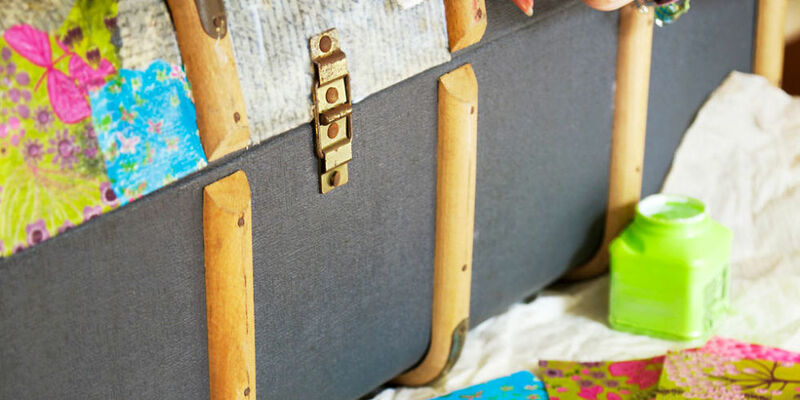 These could be items you already own but want to personalise, or items specifically bought for découpage, such as plain simple wooden boxes and frames. Do you need special paper for découpage? Wrapping paper – ideal thickness and widely used as it is available in a multitude of both traditional and up-to-date designs. Origami papers – these are small square sheets of paper with mini designs and patterns on. Copyright-free source books – these contain pictures of all types. If you are new to découpage, choose pictures which have a clear outline as this will make them easier to cut out than those with blurred edges. If you’re worried about using original pictures you can colour copy or scan them instead. What is the best glue to use in decoupage? Découpage glue – specifically for this craft and available from craft shops. It is perfect as it can be used as both glue and varnish. Try a specialist glue such as Aleene’s instant decoupage water-based glue, sealer and finish. PVA glue – all round glue which dries clear and sticks paper, card, fabric, wood and metal. Varnish – the best varnish to use is gloss as no matter how many coats you use it doesn’t go cloudy. If you require a matt finish, use gloss for every coat (to avoid cloudiness) and then use matt varnish for the final coat only. What tools do I need for decoupage? Scissors – cutting out is a large part of découpage so a really sharp pair of small scissors is important to ensure you cut clean edges. Craft knife – to cut out detail and intricate areas. Use a really sharp blade with your craft knife as blunt ones can tear the paper. Sandpaper – for sanding the layers of varnish if required. All the above mentioned materials and tools should be available in your local art and craft shops. You can also order all these items online. Once you have selected your item to decorate, make sure the surface of it is clean and dust free as the varnish magnifies any imperfections. Select your pictures and cut them out. It may be easier to cut out the pictures roughly with scissors first and then cut them out more precisely with a craft knife. If a white edge shows around the picture you have cut out, colour the edge with a crayon/pen that matches either the picture or the background on which it is to be used. Before you glue the pictures in place, ensure you are happy with the positioning. Use tweezers for placing tiny pictures. Smooth out any wrinkles and wipe away any excess glue with a barely damp sponge. Ensure the glue is dry before starting to varnish and leave the varnish to dry thoroughly between each coat. Anything from four to 15 coats may be needed depending on how thick the decoupage paper is and how smooth and durable a finish is required. To achieve a finely lacquered finish you will need to sand lightly after a few layers of varnish and wipe away all dust. Keep repeating this process until you are happy with the finish.